The first in a series of remarkable publications, this book by Jefferson Glassie probes the most intimate questions of life and the Universe. Undeterred by common beliefs and misperceptions, Glassie describes a theory of life that is truly unique. In Peace and Forgiveness, Glassie explains that all men and women are one with everything else in the Universe, and that each person is love and perfection. He shows how the things people think come from evil really come from fear. 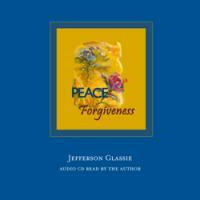 And, in order to have true peace - peace of mind - one just needs to learn forgiveness, in other words learn to let it go. This is the audiobook version, read by the author.